Accented by a simple, hand-carved wooden base, this fair trade natural cut amber Himalayan salt lamp capitalizes on the natural beauty of its materials. Whether set on the floor, a desk or any other surface, this lamp provides beautiful light and understated sensibly fashionable decor. Our salt lamps are carved by hand from solid blocks of pure rock crystal salt excavated from pristine sea beds in the Himalayan Mountains. The gentle glow of light and the beauty of the crystal's natural shape add a peaceful atmosphere to your home. Walking on the beach is a refreshing experience that reinvigorates your mind while soothing your body. Now it's possible to recreate that same feeling with our Himalayan crystal salt lamps. What is special about our lamps? Our lamps are handmade and have slight variances in their final height and weight. Your lamp will approximately match, within a range, the dimensions specified below. How long do they last? Do they ever stop working? All our salt lamps last indefinitely (after all, they are already millions of years old). They will never lose their ability to generate negative ions or help mitigate EMFs (electromagnetic fields). Negative ions are odorless, tasteless, and invisible molecules that we inhale in abundance in certain environments. Think mountains, waterfalls, and beaches. Once they reach our bloodstream, negative ions are believed to produce biochemical reactions that increase levels of the mood chemical serotonin, helping to alleviate depression, relieve stress, and boost our daytime energy. But that’s not all. Not only do negative ions help our mood, they are also natural air purifiers. Dr. Albert P. Krueger, a microbiologist and experimental pathologist at the University of California, found that a small quantity of negative ions can kill bacteria and quickly remove them from the air thereby reducing the chance of infection. 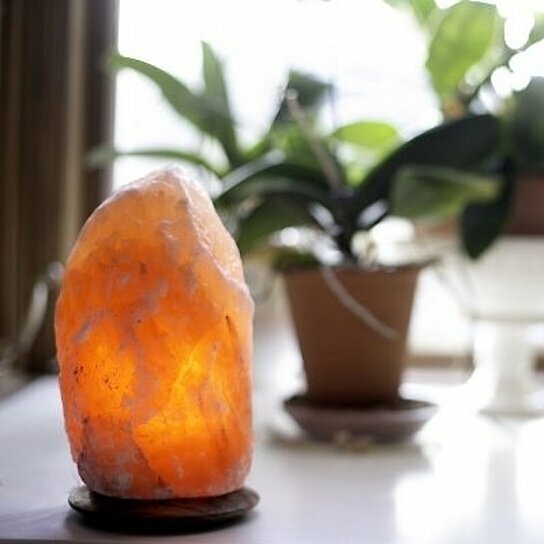 How do Himalayan salt lamps protect against EMFS?